Cameron Monfared was recognized for helping homeless students and others in the community. 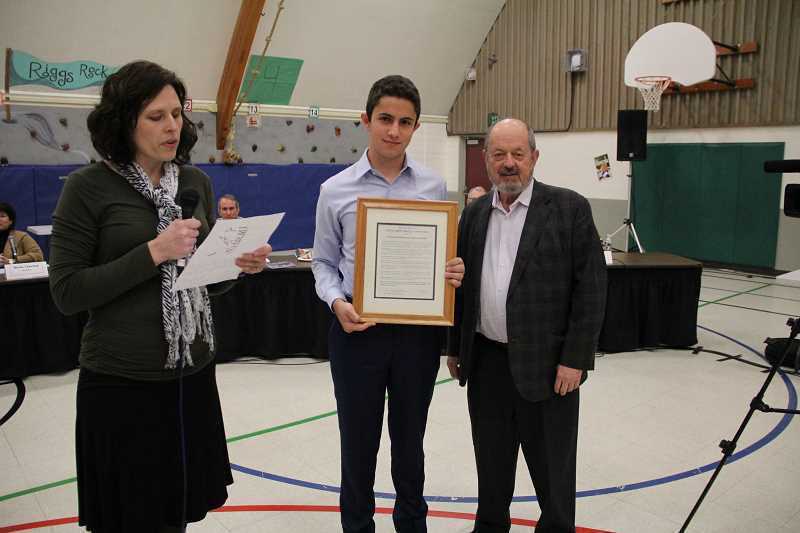 In a joint meeting between the Beaverton City Council and the Beaverton School Board last week, Beaverton High School junior Cameron Monfared received the 2017 Human Rights Advisory Commission Award. The Beaverton commission exists to fight discrimination and to make recommendations to the city ensuring equal rights for all. The commission presented its award to Monfared in recognition of his participation in many local efforts to help homeless families and individuals, and to volunteer in the community. "It's a humbling and very honorable experience to be recognized," Monfared told the Times. "While being recognized is always great, that's not what I keep in mind at the end of the day. When I am able to get these awards, it just encourages me to keep on going." Monfared's lengthy list of accomplishments include the following: serving as a liaison from the Mayor's Youth Advisory Board to the Beaverton Human Rights Advisory Commission; serving as a "young leader" on the World Affairs Council of Oregon; serving as president of the Beaverton High School Key Service Club; and co-founding Club Hope, a Beaverton High School club committed to helping the school's population of homeless students. He's also a community contributor for HuffPost,, where he writes about social justice issues. Monfared got his start as a volunteer leader back in middle school, when he joined the Beaverton City Library's teen council. The teen council would help organize resource fairs — an eye-opening experience for Monfared. "I just saw how much need was in our community, in Beaverton," he said. "Beaverton's generally a middle-class city, but we have a lot of issues we can take care of together." Monfared's voice picks up speed when he talks about the issues he's passionate about: helping homeless people, serving his community, and being a leader. In his early years as a volunteer, he noticed that too often, people would spend a lot of time talking about problems, and not as much time actually solving him. This shaped his results-oriented focus. "It would always frustrate me," he said. "I always love having these conversations, but we would sit there, and sometimes talk for hours and hours, and nothing would come of it." As president of his school's Key Club, Monfared presides over a local chapter of the largest student-led volunteering organization in the country. Under his leadership, participation numbers have gone up, and Monfared puts an emphasis on sending students out into the community whenever possible. The same holds true for his work with the newly founded Club Hope. "With Club Hope, we have been able to supply more to students at our school," Monfared said. "Over the summer, in the community outreach capacity that I serve in, we spoke to and interacted with over 200 families." Monfared knows he has more drive than the typical high school student — or the typical anyone, for that matter. He used one of his favorite expressions — "If you're not outraged, you're not paying attention" — to explain where his motivation comes from. "I don't mean outraged in a way that's angry — I just mean that if you see people sleeping on the streets, if you're not outraged about people going to bed hungry, then you're really not paying attention," he said. "If you're not outraged, then we're lacking a moral duty to help one of our fellow citizens in a time of need." Monfared's parents escaped from Iran as young teenagers during the Islamic Revolution in the late 1970s, and found success in their American education and careers. Learning about their struggle also had a big impact on Monfared's outlook on life. "I've been privileged enough not to experience those hard times, but hearing about them makes me more grateful for what I have, and makes me committed to making sure others are able to prosper," he said. After high school, Monfared isn't sure where he wants to go to college, but he does know that he wants to study business and law. Whatever career path he ends up taking, he plans to keep his volunteer spirit alive. "Whatever I do," he said, "even if I end up in business, I want to make sure I'm always doing something to benefit the community."